Packaging Specialties is a box manufacturer and wholesale distributor of on-trend, quality retail packaging supplies. 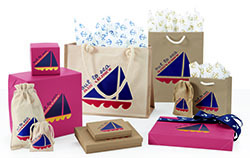 We offer a comprehensive line of color coordinated bags, boxes and tissue. Let us help you with your brand packaging. Stop by our booth in the lobby area, email us at marketing@pack-spec.com or call our sales team at 800-722-7732. Looking to update or refresh your packaging? Stop by and take advantage of our show only specials - promotional pricing on products and printing! Special promotional pricing on our enviro european shoppers with cotton rope handles. Select colors, while supplies last - shimmer amethyst, shimmer raspberry and shimmer honeysuckle. Add your branding in a metallic foil hot stamp for an upcale look! Stop by to take advantage of our show special pricing on our upscale rope handle non-woven totes available in our two most popular bag sizes. Perfect for in store promotion like a gallery special event, new opening, or a pop up event. Perfect for special gallery and in-store events or as a limited edition collection bag - our reusable cotton poly blend totes can be designed with 2-sided full color graphics to get your brand noticed! 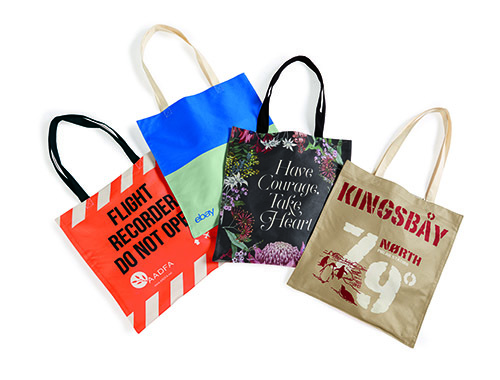 These eco-friendly totes feature a lightweight soft cotton poly blend material and is available in our most popular 15x16 bag size with shoulder length handles. Choose from a variety of handle trim colors to coordinate with your bag design. Upscale your look with 4 color process and silk screen branding. Featured items include our new Midtown shopping bags in basic white and accented with our colorful sea glass tissue and double face satin ribbon in coordinating beachy hues. Add a coordinating eco-friendly jute with cane handle tote or canvas jewelry pouch with silk screen branding. 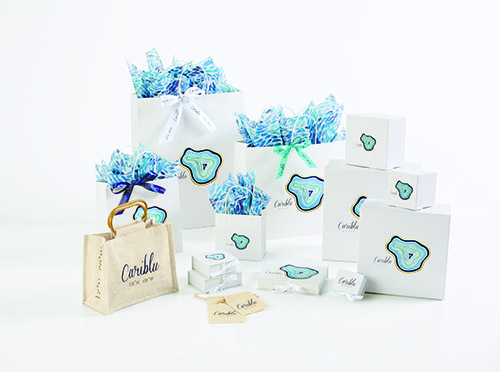 Boxes include our premier rigid style gift boxes and luxe ribbon jewelry boxes in a matte laminated white finish. Our new stone white box color is the perfect neutral accent to any packaging program. Featured items include eco-friendly packaging options like our enviro euro tote in silver metallic, duet paper shoppers which feature a white exterior/kraft interior and reusable natural canvas totes and jewelry pouches. Other featured items include our stone white one piece style gift boxes with branding uniquely positioned on the front and side box panel, pillow pouches and luxe ribbon jewelry and gift card boxes in a matte laminated silver color! Update your packaging with rose gold! 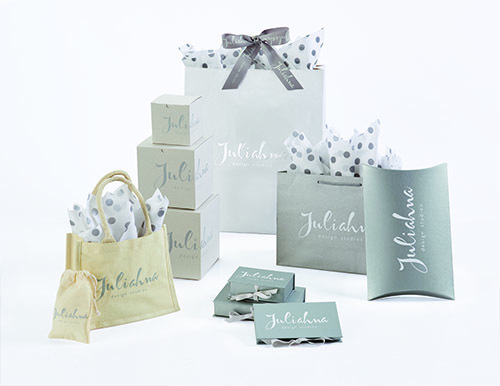 This trendy new neutral shade is available in gift boxes, tissue paper and metallic foil for hot stamp branding. Featured collection items include our new line of midtown shopping bags in tarnished grey and white hot stamped in rose gold metallic foil and accented with rose gold metallic and grey dots tissue. 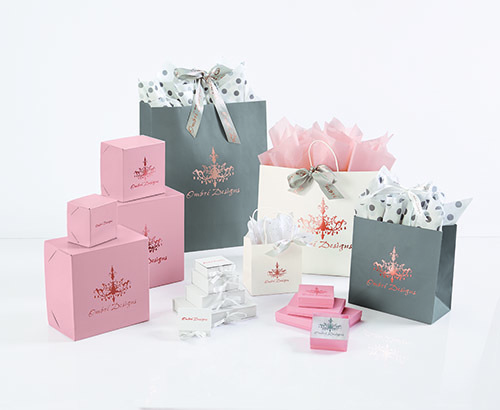 Coordinating boxes include our matte pink cotton fill jewelry boxes and luxe ribbon jewelry boxes in white. Create a unique look with mix and match packaging. Featured items include our signature uptown euro totes in a soft kraft color with natural colored rope handles and our resort style canvas/jute tote both accented with a nautical anchors tissue in metallic gold or navy blue. Assorted box styles including merlot gloss gift and apparel boxes and kraft cotton filled jewelry boxes or canvas pouches perfect for jewelry and artisan accessory items.